Greater Lyttonsville is part of West Silver Spring, which is an inner-ring suburb that is almost built out. Greater Lyttonsville consists of close-knit, well-maintained residential neighborhoods as well as an industrial area along Brookville Road and a commercial area along 16th Street. The population is increasingly diverse, with young families living side by side with long-time residents. The diverse housing types include single-family homes, townhouses, condominiums, and garden and high-rise apartments. Neighborhoods are compactly developed and residents walk, bike and take transit in addition to driving. The popular Capital Crescent Bike Trail runs through Greater Lyttonsville before ending in Silver Spring to the east. The Brookville Road industrial area provides light industrial and commercial services.This corridor is an intensely developed area of more than 100 acres and 1.4 million square feet of space in 50 buildings. Several large public agencies have located offices or maintenance facilities in Greater Lyttonsville, including the Ride-On Bus Depot, the Washington Suburban Sanitary Commission (WSSC) facility. The Forest Glen Annex to Fort Dedrick is located on the community’s western edge. 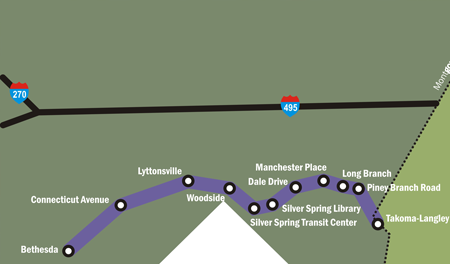 The Purple Line will run through and have a station stop in Lyttonsville-Rosemary Hills. In mid-March, Maryland Transit Administration officials announced that a proposed Purple Line rail yard is slated to move farther from the residential neighborhoods to the Brookville Road industrial area. Some hadexpressed concerns about the original rail yard location last fall to Planning Director Rollin Stanley, who analyzed the potential Purple Line rail yard locations and framed the discussion for transit officials, who then decided to relocate. Request a meeting with your group! We would like to hear more about what works well, and what doesn’t in Greater Lyttonsville. Or let planners know what makes Lyttonsville-Rosemary Hills special or what you would like to see changed in the upcoming sector plan. Weigh in using our comment tool. Planners will learn more about Lyttonsville-Rosemary Hills through your comments. Express yourself in images by uploading your favorite pictures to our community photo gallery.